Reports of this celebration show that colonist Edward Winslow expressed the gratitude of the colony during the feast by saying, "[Y]et by the goodness of God, we are so farre from want[.]" That is the story we all remember, and the three-day feast really did occur in 1621. But that was not the origin of the Thanksgiving Day we celebrate today. In large part, the first Thanksgiving Day, which was celebrated in 1623, was a celebration of the abundance arising from the pursuit of individualism and incentives associated with free markets, amazing as that may seem. The background for understanding Thanksgiving Day is found in records kept by the governor of the Plymouth colony, William Bradford. He informs us that the colonists' English sponsors had arranged for all crops and goods to be held "in the common stock," from which they would be supplied to each family according to its needs (sound familiar?). As with many other recorded instances of collectivism in the history of mankind, there were disastrous results. Governor Bradford wrote that this experiment reflected a belief of his that common ownership of property would allow the colony to flourish. Instead, it was soon found that communal sharing resulted in unintended consequences. The colonists, as many others have discovered over time, found that individuals work harder within an incentive system that allows them to maintain and enjoy the fruits of their own labor. Desperate not to repeat the mistakes made by the failed communal settlement in Jamestown, Virginia, where half of the original settlers were lost to starvation or disease, the colonists met to find ways to escape a similar fate. They decided to abandon their communal arrangement for the distribution of goods. Instead, according to Gov. Bradford, from that point forward, "they should set corn every man for his own particular [need]." Each family would be given a parcel of land to cultivate, and they could keep what they grew from that plot of land (even if they could not deed the land to their heirs, since the ownership of the land was still held communally). Records were kept, and the records showed that the American colonists in Plymouth Plantation exhibited a dramatic increase in productivity after this change of economic system, where everyone could produce his own food on his own plot of land. Unfortunately, this success was offset the following summer (of 1623) by a drought. The colonists prayed and offered contrition to God, and, to their amazement, shortly thereafter, the drought ended, and the harvest was saved. And so it was that the colonists set about to celebrate a "day of thanksgiving to God" that Americans continue to celebrate to this day. Their new economic system that relied on individual efforts and the incentive of keeping the fruits of their own labor ensured that they would be able to produce enough food for the future and brought them great happiness. This system continues to thrive within the freedoms enshrined in America's national heritage. Nearly 170 years later, in 1789, following a proclamation issued by President George Washington, America celebrated its first official "Day of Thanksgiving to God" under its new Constitution. That same year, the Protestant Episcopal Church, of which President Washington was a member, announced that the first Thursday in November would become its regular day for giving thanks, "unless another day be appointed by the civil authorities." 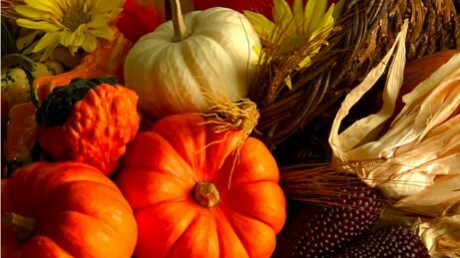 It wasn't until some seventy-four years later, in 1863, that President Abraham Lincoln issued a proclamation setting aside the last Thursday of November as a national Day of Thanksgiving. Over the next seventy-eight years, presidents followed Lincoln's precedent, annually declaring a national Thanksgiving Day. Then, in 1941, Congresspermanently established the fourth Thursday of each November as a national holiday. So there you have the history of the celebration. Now, a few words on what Thanksgiving means in 2011. The lessons of the benefits of individual enterprise, and the increased productivity resulting from the freedom to keep what you produce, had dramatic affect on the productivity at Plymouth Plantation. It also had great effect on the growth of the United States of America for over two hundred years. However, for the past hundred years or so of our American history, there has been a minority of Americans who have felt that the American tradition of individual enterprise fails to adequately provide an equal result for everyone. They, in opposition to American tradition, feel that wealth inequality is not healthy, and they wish to move the country to some sort of communal arrangement, as they had in the Plymouth Colony and in Jamestown, where wealth effectively belongs to the government and is distributed to those in need by the benevolence and wisdom of said body. That is not the American way. We believe in the sovereignty of the individual and private property rights, not the sovereignty of the collective. On this Thanksgiving Day in 2011, let us give thanks to God for the bounties He has provided us in America. Those include the "blessings of freedom" mentioned in the preamble to the greatest governing document ever written, our Constitution. We should thank Him for enabling us to continue to be able to preserve our liberty in this unique and exceptional country of ours, and to prevent from achieving their stated goals those who would destroy this Land of the Free and Home of the Brave by replacing our free-enterprise, private-property system with a collective redistribution of resources to equalize wealth. And, last, but not least, we should thank the American Armed Forces, including those who made the ultimate sacrifice for their country, for their defense of this great Republic, and its freedoms, for the past 235 years. Our Declaration of Independence states that it is a self-evident truth that all men are created equal. That is, every man is born with the same opportunity to make of his life what he chooses. Not every man will seize that opportunity, which is why there is an inequality of results. But, allowing each to plow his own plot of land and keep the fruits of his labor is what the colonists discovered was the secret to productivity, wealth, and happiness. We must work hard to preserve that exceptional American tradition. We have much to be grateful for on this Thanksgiving Day in 2011. God Bless America! Gary Aminoff is a commercial real estate broker in Los Angeles and is president of the San Fernando Valley Republican Club. He can be reached at gaminoff@aminoff.com.